Florida Book News: WRITER'S BLOCK BOOKSTORE PRESENTS AMERICA’S ENERGY DOCTOR, DR. JASON LITTLETON, M.D. WRITER'S BLOCK BOOKSTORE PRESENTS AMERICA’S ENERGY DOCTOR, DR. JASON LITTLETON, M.D. AMERICA’S ENERGY DOCTOR, DR. JASON LITTLETON, M.D. ABOUT THE AUTHOR: Jason Littleton, MD is a board-­certified family physician offering convenient concierge healthcare. He emphasizes personal attention, prevention, and smart lifestyle choices for optimal health, wellness, energy, youthfulness, longevity, balance, and happiness. He encourages patients to eat nutritiously and focus on fitness, providing clear, practical, personalized guidance for doing so in our busy lives. 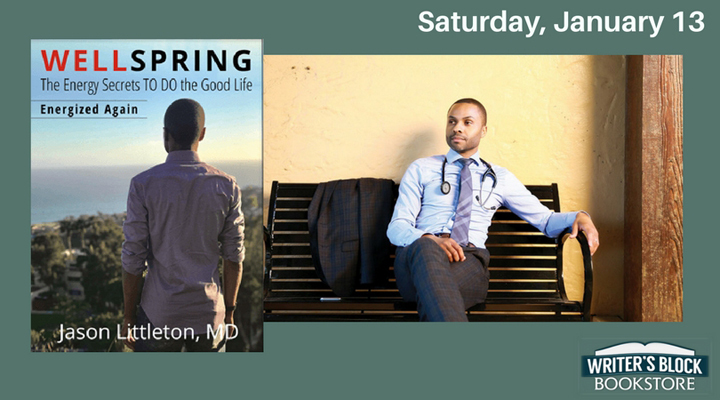 Additionally, Dr. Littleton is CEO of WellSpring Human Energetics, author of WellSpring: The Energy Secrets to Do the Good Life, an in-demand motivational health speaker, and frequent guest commentator on national television programs and in national print publications.